06.09.2004 - I captured this small armadillo by hand. I was at an armadillo trapping job, when I noticed this dillo scurrying through the underbrush. I chased after it, and despite its attempts to escape via short and quick erratic hops, I was able to get my hands around it and pick it up. I don't think I would have been able to do so if this were an adult armadillo. The young ones have a softer, more flexible shell, as you can see in the above photo. 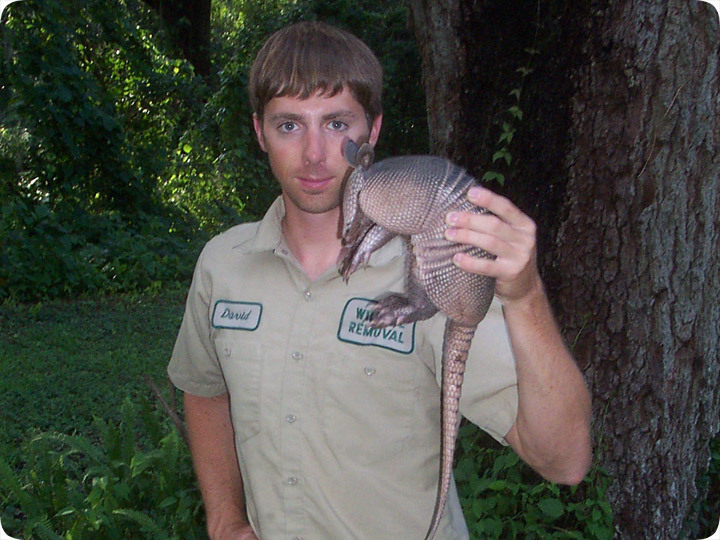 Adult armadillos have much harder shells, and thus are hard to hold. In addition, adult armadillos are much heavier and stronger and faster. Luckily, capture by hand is not the usual or preferred method for armadillo removal. I usually just set traps, and trap and remove the critters. In fact, it's very rare to even spot an armadillo during the day, because they sleep most of the time, and they are primarily nocturnal. If you do see one, it's probably nearby one of its many burrows, so it will likely make an escape before you can even get near it. However, I was able to catch this little guy. What Would Be The Best Place To Release A Armadillo? - Choosing the right location to release an armadillo that has been caught in a cage trap is an important part of the process, and it is always worth considering the surroundings before releasing the animal. One of the first things to consider when finding the best place to release the animal is the natural habitat, and where possible it is best to release an armadillo into a swampy or woodland area. It is these locations that offer the access to the kind of ground cover that gives the best chance of survival, and armadillos are much more suited to these habitats than urban areas. Another factor to consider when choosing where to release an armadillo is whether or not the location is close to other domestic properties, as this can often mean the animal will quickly become someone else?s problem. It is also worth taking the animal at least five miles away from where it has been caught to make sure that it doesn?t return to its old burrow. One fact worth noting is that armadillos can release a pungent musk when they are threatened or nervous, so it is best to use a truck when carrying the live animal where possible. When You See Armadillos In The Middle Of The Day - There are a number of different reasons that people can see an armadillo during daylight hours, but generally armadillos are nocturnal animals that will prefer to spend the daytime sleeping and resting in their burrow. For many armadillos that live in woodland areas they will often simply dig their way down into a pile of dry leaves or similar ground cover, and if they are disturbed during daylight hours they may move away to find a different place to sleep. This is one situation in which it is possible for people to see an armadillo in the daytime. Another situation in which it can be possible to see an armadillo during the day is when it is a female looking for food to feed her young, and this will often overcome the natural nocturnal instinct. It is also possible for armadillos to become active during the day if they are ill or have been injured by another animal, and they may also be disorientated or act in an unusual way in this case. Whatever the reason that you see the armadillo, if it seems uninjured and healthy then it is best to ignore it and allow it to continue without disturbing it.